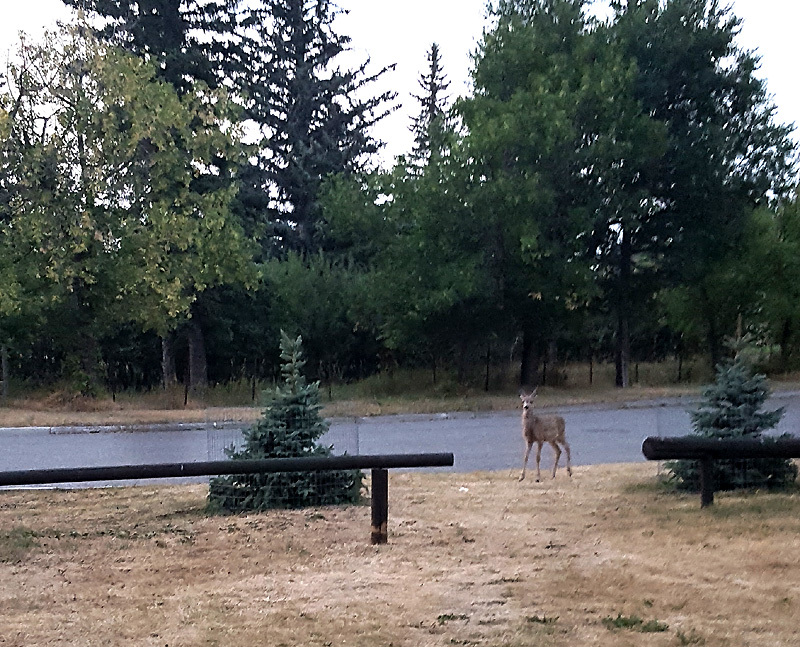 I unzip the tent fly early this morning to see a deer strolling by our site. Jack’s immune to them since they’re always in his back yard, but I still get a thrill. Maybe he thinks javelina are neat. Phil is unusually still asleep this morning as Jack and I are folding up tents, but minutes later he’s out, dressed, and folding his own. That guy moves fast. 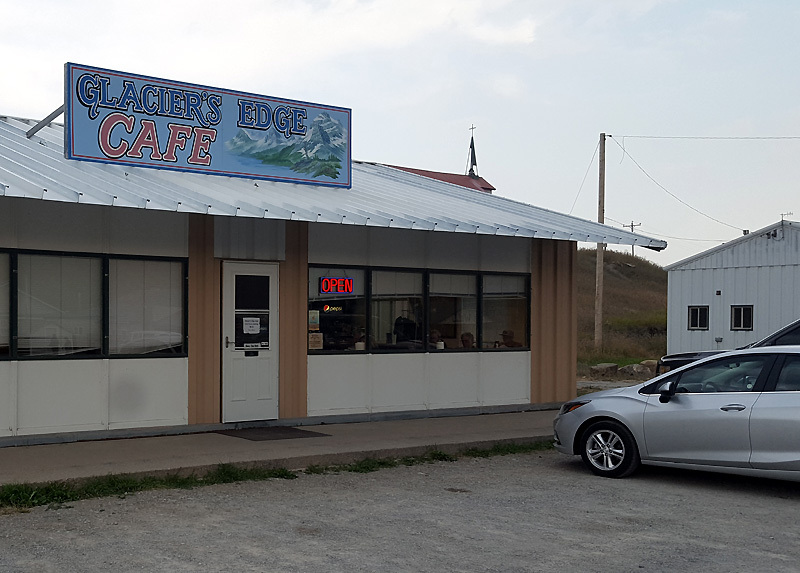 Our maps suggest there are few provisions out on the route today, so our first stop is a c-store. We head south out of town on 6. A tiny tailwind aids our progress – it’s the first one this tour I think. 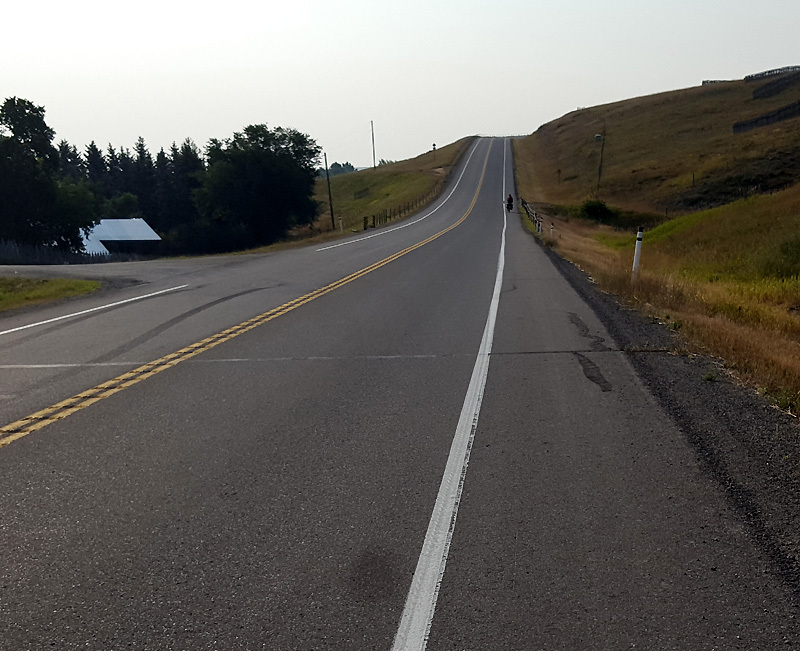 There are pretty rolling hills 100′ and 200′, some of them a little challenging. 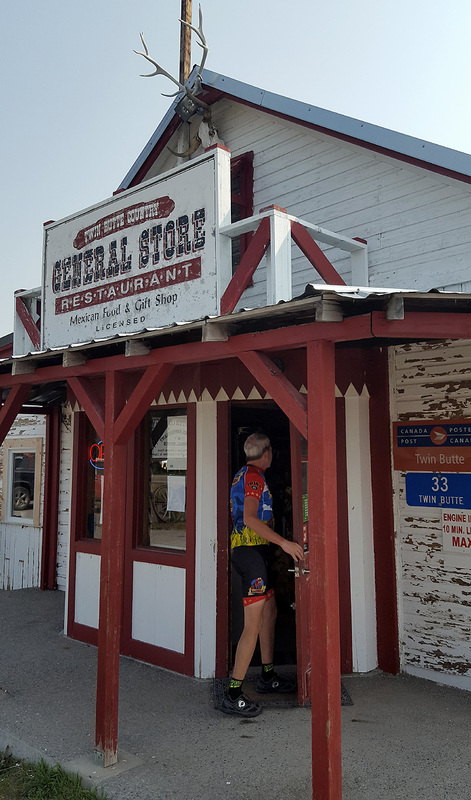 Eighteen miles takes us to Twin Buttes, where there is a great little general store and restaurant. I sit out front with a cold bottle of OJ waiting for the guys. My morning intention had been to stop frequently, but instead, I’d ridden the eighteen miles straight out. 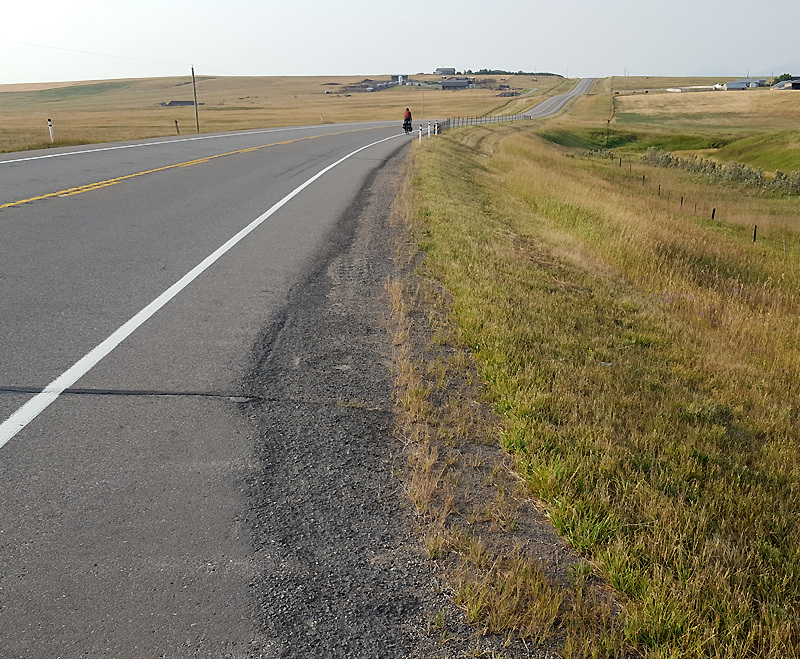 Once rolling, I just didn’t feel like stopping – maybe it’s the tailwind. A foursome touring group rolls in. Nice guys from Minnesota, one wearing a Chicago Bears jersey. Young and athletic, they’re toting 2 panniers each, travelling pretty light. 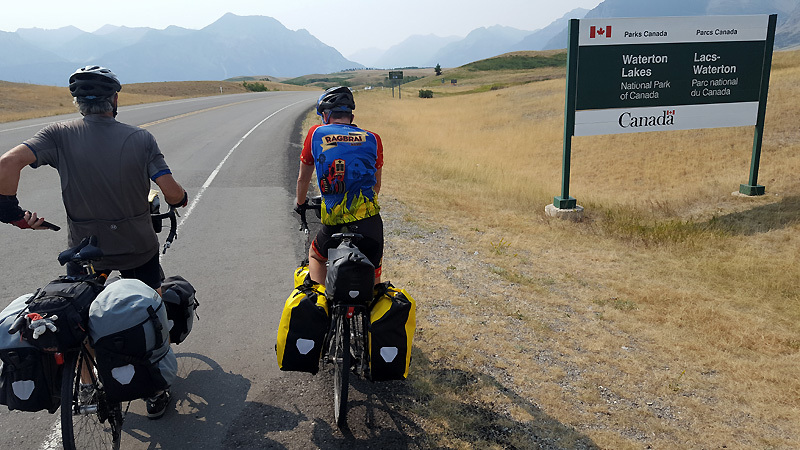 They’re doing the same route as ours from Jasper to Missoula, and will reach St. Mary tonight, then climb Logan Pass tomorrow. Sharing two 2-man tents, hence the small cargo. We take off. 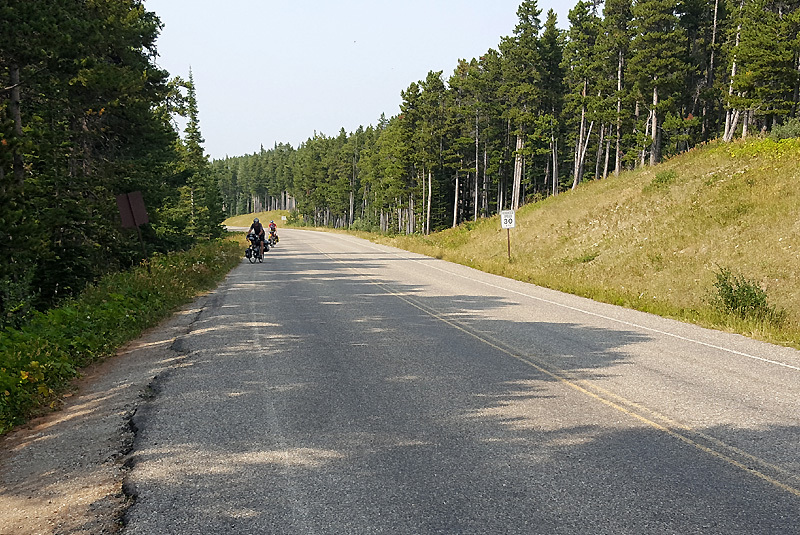 Five miles later, just past the Waterton Front Overlook, the foursome comes roaring by in drafting/hammer formation, giving me the thumbs up. Friendly guys. But hammering? Drafting in a tight formation while touring? It would be like, I dunno, going out for a leisurely stroll with a box balanced on your head. It takes too much effort and too much attention. Interferes with being able to take in the sights. To each his own, of course. 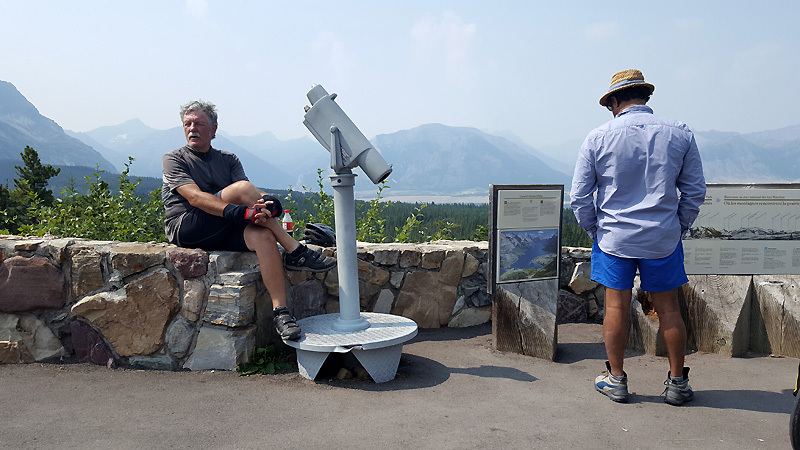 At the northern edge of Waterton Lakes National Park, we regroup then take off. Phil’s a quarter mile ahead when I spy a sign that says “Bison Paddock.” Well, I want to see that! Jack is behind me but off on a nature call. I figure to get a quick photo and get back on route. I go in and up a short hill, but no bison are visible. A few hundred more yards. No bison. Down a very steep rutted hill. Still no bison. Turn into what is labelled the “paddock.” No bison. 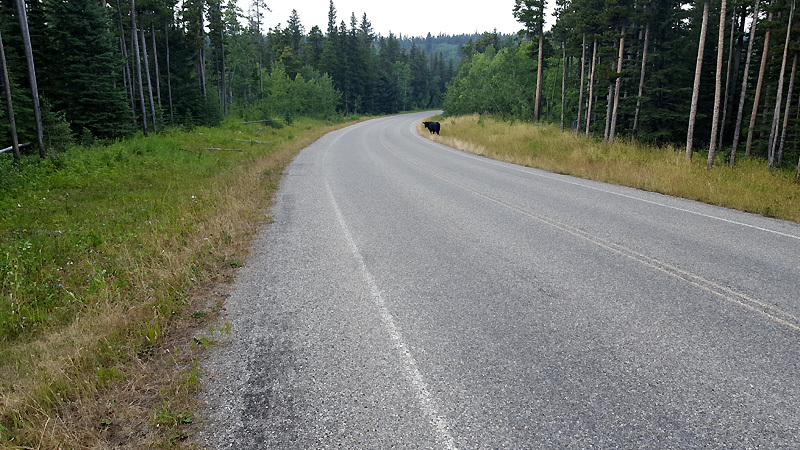 Two miles in I come up over a rise to find about 8 bison scattered – you guessed it – right at the road’s edge. Three cars are parked, two among the bison and another a hundred yards back taking telephoto pics. I slow and stop, then proceed very slowly past the first car. The closest bison turns deliberately to face me and puffs up defiantly. Uh-oh. I stop. And wait. The bison is obviously defensive about the bike. There are a couple of calves in the group, which might help explain the behavior. Hell, this bison may never have even seen a bicycle. Even when I try to walk the bison bristles. I stand and wait. 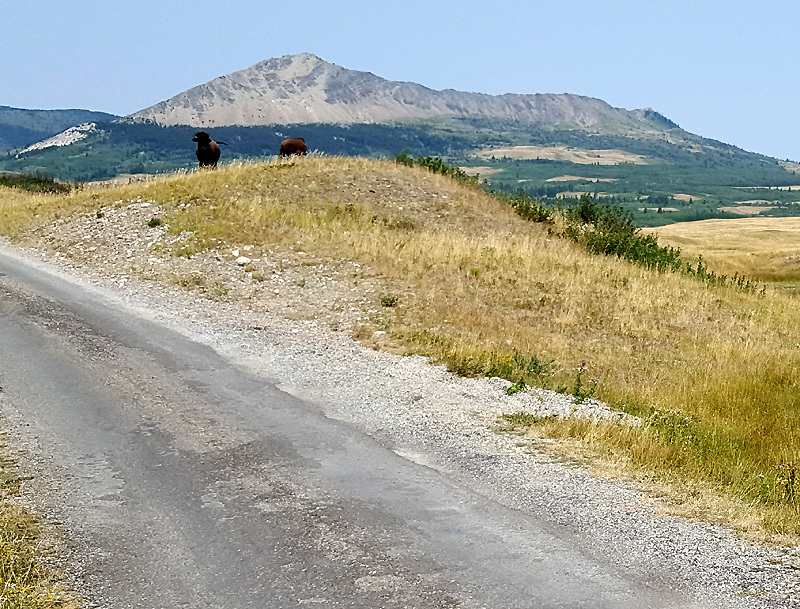 I consider gunning past, but I’m also thinking a determined bison could likely outrun me in a heartbeat, especially with these hills and my loaded panniers. What to do? There is zero cell coverage here so I’m unable to let Jack or Phil know of my predicament, as entertaining as it is. I wait. And wait. 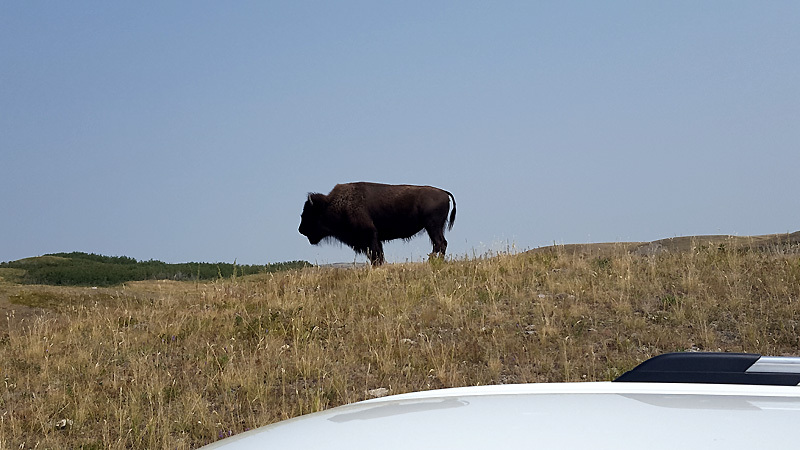 The car behind me has been taking photos of me as well as the bison, so I slowly back up to them. They’re a super-friendly couple from Germany who are amused at my plight. The lady suggests that my bright red jersey might be spooking them. I ask, only when they are ready to move on, that they might be able to drive very slowly for a few hundred yards, so that I might be able to crouch behind their car and walk my bike to get past. Fortunately, that plan works well and I finally make an escape. We (the German couple and I) actually do this procedure once more on the way out. 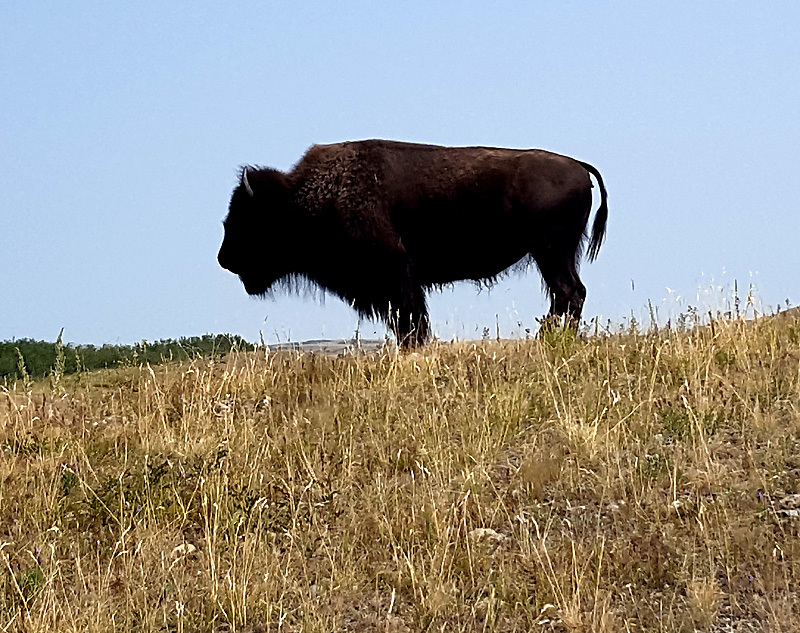 Well I’d been hoping to see bison and I certainly did. Wow and whew. 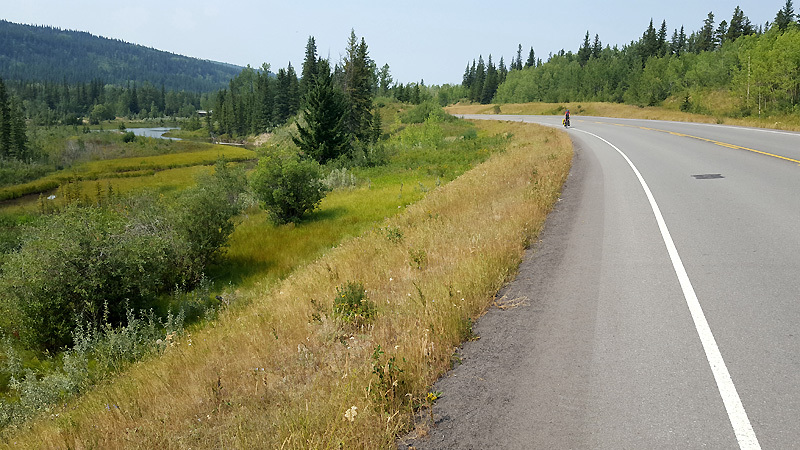 The road descends to a lake area (Maskinonge Lake) and then continues to the United States border in two fairly long climbs. The first is probably 1300′, nothing to sneeze at. At the top I catch the guys resting at a scenic overlook. Phil said they’d only been there about 10 minutes and had received my message. They were worried with my falling behind. There are a handful of road racer types out here doing hill repeats. 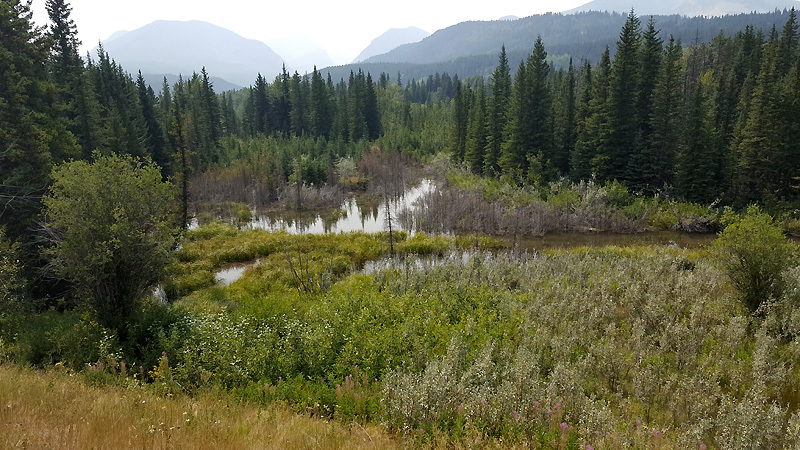 We could see why – what a glorious place to train. GREAT climbing in GREAT scenery. The riders seem to be doing loops between the border and the lakes. 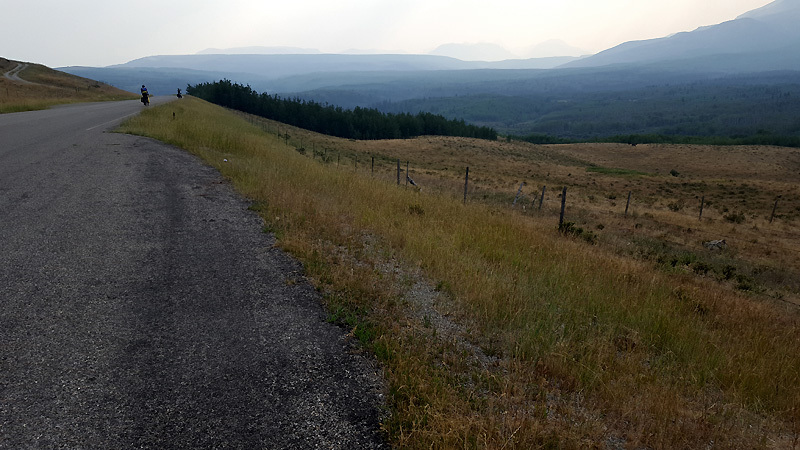 We leave the overlook and I eventually take the lead up the second climb to the border, another 800′ grind. 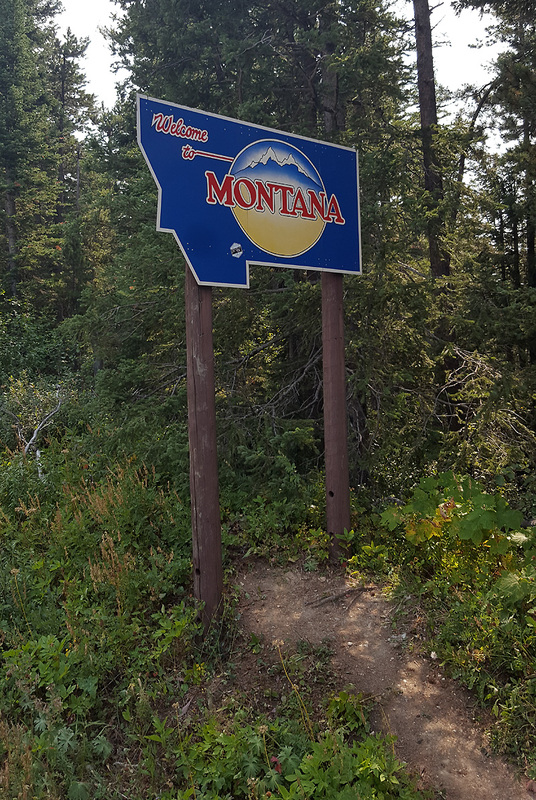 Once through, I pull over to down a candy bar, now back in Montana and the good old United States. We all grab water at the border station. One of the Border Patrol guys suggests that a motorcycle would be much easier. I tell him it would be much less fun, however, and then we both laugh. Maybe he’s right. Afterward I got to thinking that he probably sees cyclists arrive all the time, but they’ve just climbed a couple thousand feet and appear at their worst. The climbing is not quite over. 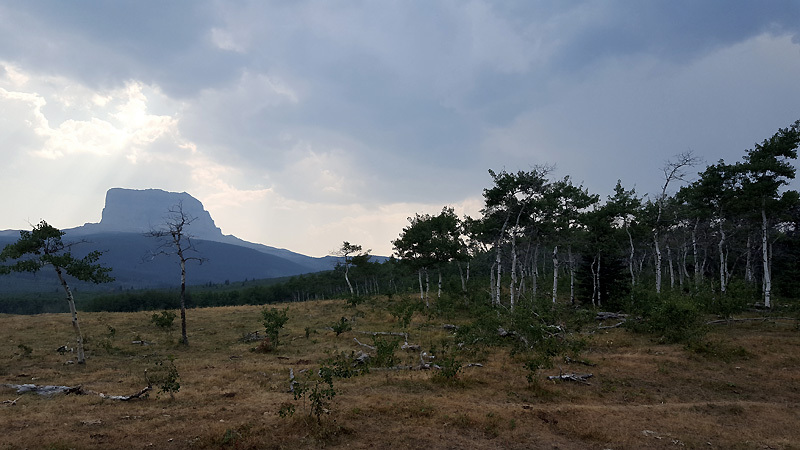 We continue to get 100′ and 200′ rollers through the top corner of Glacier National Park and into the Blackfeet Indian Reservation. Wonderful riding. Overcast, real nice. 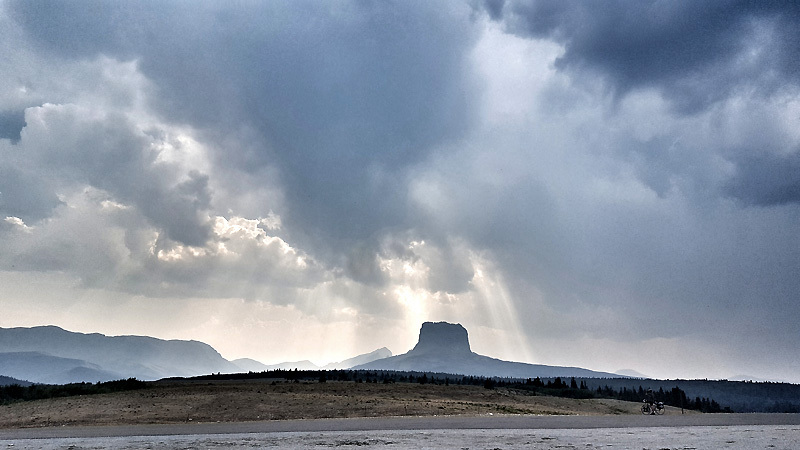 A magnificent formation appears to the west called Chief Mountain. 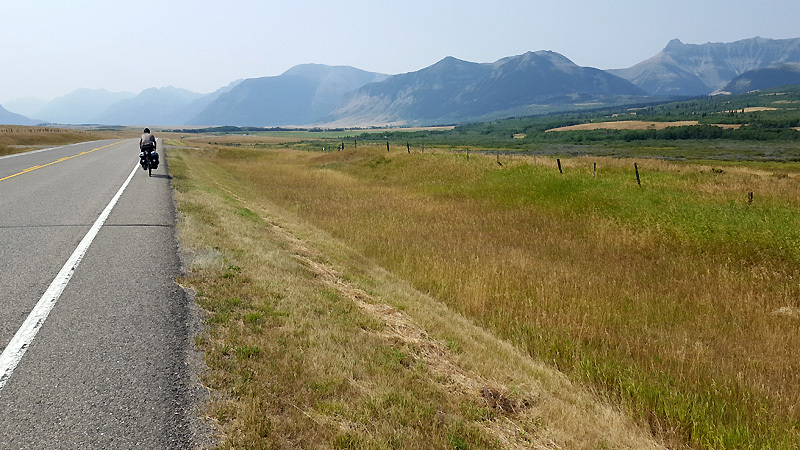 Jack and I’re on high look out for bears – seems like a good place for them – but all we see are numerous cattle, many of them right on the roadway. Some of them look like bears from a distance. The 55 mile mark brings a marvellous downhill. Jack and I are soon at 35 mph watching far out ahead for rough road surfaces. What a rip – it’s too much fun. The road descends all the way to US89, followed by another 4 flat miles to the town of Babb. Oh my, the motel rooms in Babb do look inviting to us all, even though they’re expensive ($138). 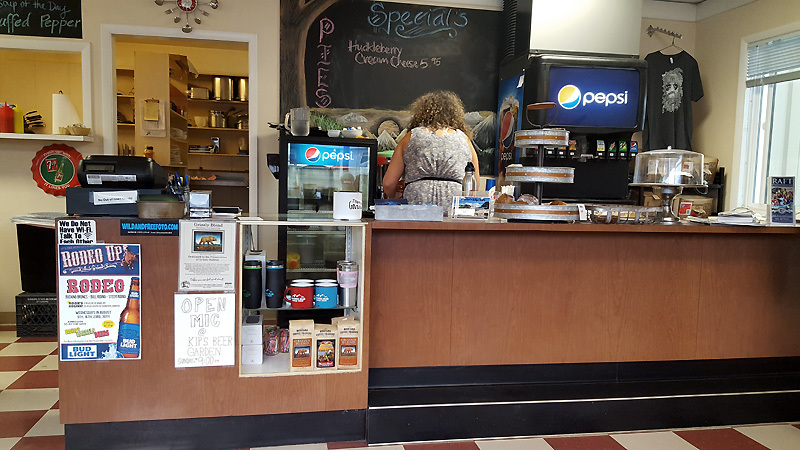 Afterall, there is a general store and a restaurant/cafe right across the street. We decide to get 2 rooms, shoot for it, and Jack “wins” the single. Once we see the rooms it’s clear we could actually have gotten 1 room for all – they’re HUGE and comfortable. A little strange that there is only 1 TV channel and no WIFI, but at least they have a DVD library at the general store. 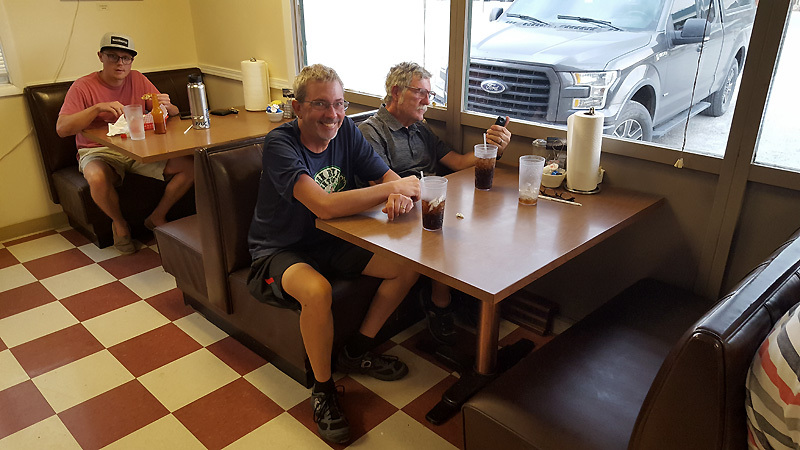 Dinner at the cafe is good, a burger and 4 Pepsis for me. A cold beer would have been nice but we discover they’re celebrating Indian Days this weekend and all alcohol sales are banned August 10-13. [What kind of “celebration” is that?] For dessert, Jack and I order vanilla milkshakes to go. With a spoon please. Phil hits the pillow while I stay up to watch the DVD movie “42,” a tribute to Jackie Robinson. What a fantastic day on the bike! 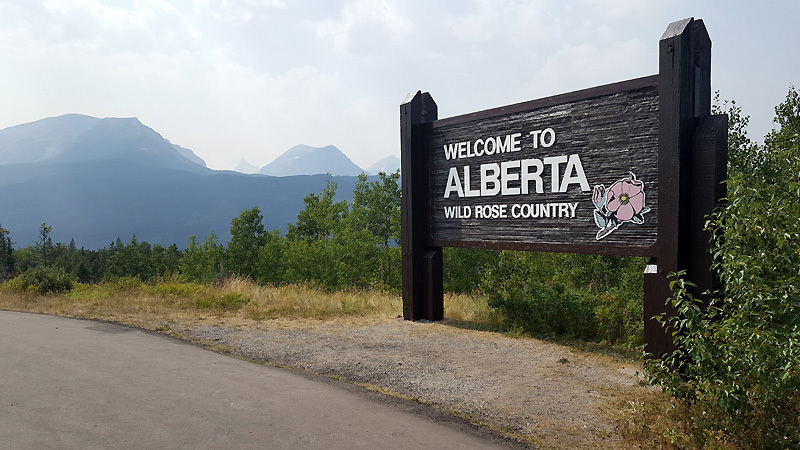 Sixty-two miles and 4200′ of ascent with gorgeous scenery through the edges of 2 national parks and 2 countries. Add in a brush with bison and it really was one helluva day. In fact, I think this perhaps was one of the toughest terrain days I’ve ever done, although truthfully it is hard to top Washington and Rainy Pass (6400′) or Mt Lemmon (5500′) in that category.